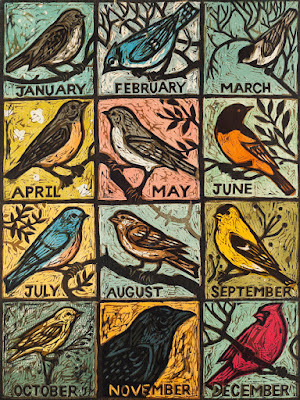 It is, of course, absurd to attempt to encapsulate any whole year in a single word, but nonetheless, it clearly appeals greatly to the human urge to categorize, simplify, and identify patterns. The Germans did it first, in 1971, and there have been English “words of the year” since about 1998 (as far as I can see.) There isn’t just one, because of course there is no one official language organization for English. So here are some Words of the Year 2016 from several sources. surreal - marked by the intense irrational reality of a dream. This word was selected by Merriam-Webster, based on spikes in look-ups of the word on-line over the course of the year. Apparently people look up the word surreal every time there’s a terrorist attack or political upheaval of some kind. As Merriam-Webster explain, “Surreal is looked up spontaneously in moments of both tragedy and surprise.” The word actually dates to the 1930s to refer to the artistic movement, and as an art-historian-type, the 2016 sense strikes me as not quite an accurate usage - at any rate, I don’t think of terrorism as being “surreal”… but I guess if enough people do, then the meaning simply shifts. singular “they” - This word was selected as the 2015 Word of the Year by the American Dialect Society. They have not yet chosen their word for 2016 (but are now accepting nominations, if you want to send them some suggestions.) Read my previous post on the use of they as a third-person singular gender-neutral pronoun; it’s a usage that’s been around since at least Chaucer. But what’s new is that they is now also being seen to include non-gender-binary usage. It can mean he, she, or neither/something else. It simply means that gender isn’t being specified in the sentence. I’ll be curious to see what the American Dialect Society select for 2016, and whether it continues in the depressing vein begun by the others. Words have incredible power. They can shine a powerful light on the truths of our society and culture, and they have the power to hurt us and to define us. But they also have the power to uplift us, and we don’t have to let them confine us. Let’s make 2017 a year in which we make sure that the words that describe us are more inspiring. Best wishes to all for a new year of unfaltering hope and many joys. Arguably the best-known fantasy poem in the English language is “A Visit from St. Nicholas,” aka “’Twas the Night Before Christmas.” Perhaps the most interesting thing about it is the way it’s spread and shifted since its first publication in 1823. For example, some editors have bowdlerized the line “the breast of the new-fallen snow,” and others have changed “ere he drove out of sight” to “as he drove out of sight,” thinking “ere” too archaic. In my opinion, such editors are seriously insulting readers of all ages. Children are perfectly capable of taking the occasional unfamiliar word in stride, just as they can take the “sugar plums” and the “laying his finger aside of his nose,” both of which were unfamiliar concepts to me as a kid. The names of the reindeer have also shifted, from an originally Dutch version (Dunder and Blixem) to, more commonly, the German version (Donner and Blitzen). I don’t know why that is. Clement Clark Moore’s image of St. Nicholas was enormously influential, along with Thomas Nast’s illustrations. (That’s if indeed we assume the poem was written by Moore. There is a certain amount of controversy over that, although apparently the balance of expert opinion tips toward Moore.) The plump “right jolly old elf” with the white beard and the pipe are now the invariable image of Santa Claus, but there were many possible versions in the first half nineteenth century. The one thing that I think hasn’t stuck about Moore’s version is the size. 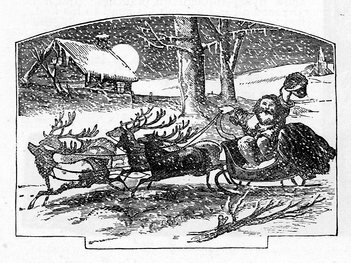 We see “a miniature sleigh and eight tiny rein-deer, with a little old driver.” As a child I took this to mean that St. Nick was actually much smaller than a normal adult. Then it occurred to me that perhaps this was perspective and they looked small because they were distant. But then I shifted my interpretation back again: we hear “the prancing and pawing of each little hoof,” and of course he was able to bound down the chimney which, in a chubby man, certainly implies general smallness. Finally, it’s worth noting that St. Nick’s job here is just to fill the stockings. There’s no Christmas tree mentioned in this house, and Santa Claus isn’t delivering a ton of large consumer goods. We’ve had serious gift inflation in almost two centuries. Not that I’m complaining - I love a treeful of gifts for all - but it’s worth noting that originally we were expecting a few little treats, not dozens of Nintendos! It’s hard to step foot in a mall or store these days without seeing the fancy coloring books that are all the rage. 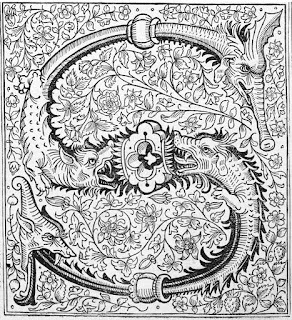 If you enjoy coloring, you should definitely check out the coloring pages provided by a number of museums and libraries, featuring items from their collections. I’m particularly partial because any librarian looking for black and white images suitable for coloring is likely to end up with a preponderance of wood block prints to reproduce, and that’s what you’ll find in these coloring books. Admittedly, not all the images really make the greatest coloring pages - some have grey-tones, which aren’t so nice to color over, some have too much open space, or not enough interesting details. Still, the pictures are fun to look at in any case, and you’ll find a nice variety of abstract designs, pretty scenes, and all sorts of images that are just plain weird. So grab your colored pencils or fine-tip markers, print out a few of these historical pages, and go crazy! It’ll be a good way to create a calm, colorful oasis in a busy, stressful season. The Dittrick Medical History Musem in Cleveland has provided this cool seventeenth century mechanical hand. 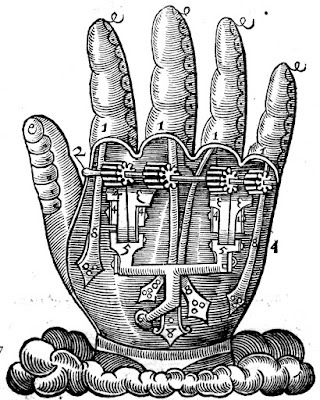 I wonder whether anyone was ever successfully fitted with one of these pre-steampunk cyborg attachments! And I love that it's emerging from clouds like a divine apparition. The whole coloring book is here. 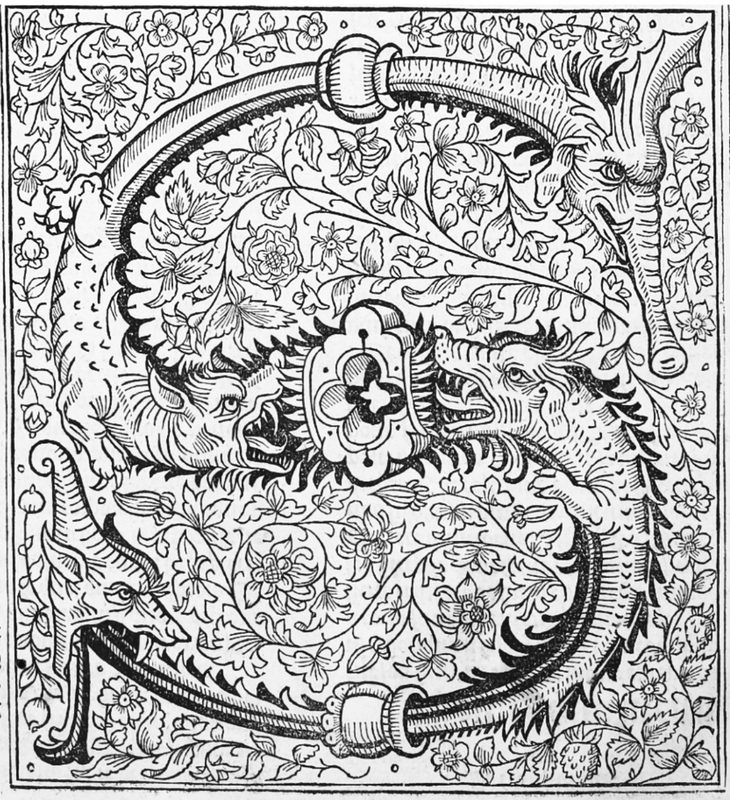 From Oxford’s Bodleian Library we get a wonderfully fancy initial, with monsters and flowers, two of my favorite things. I think this one would work particularly well as a coloring page. The whole coloring book is here. 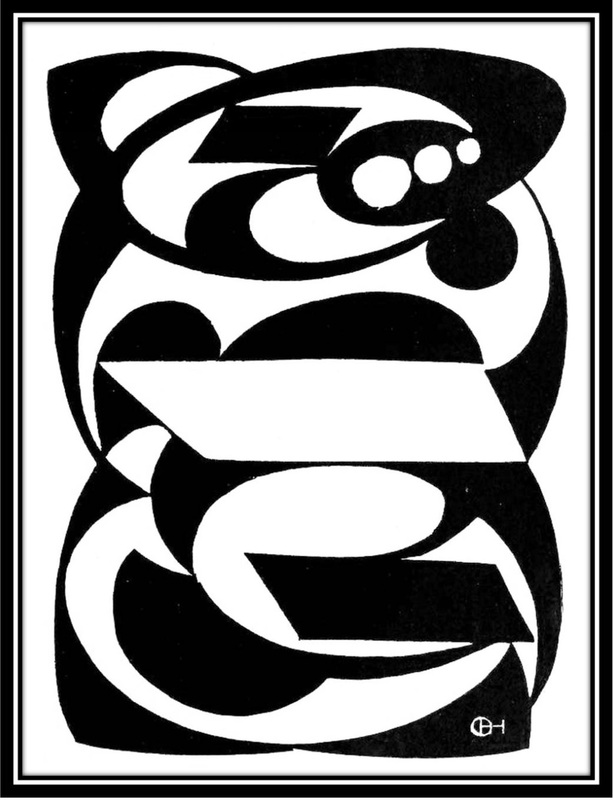 If you want something more modern, how about this great abstract design from the Smithsonian Libraries? It doesn’t have as much detail, but it could be very bold, with lots of scope for experimenting with color choices. The whole coloring book is here. 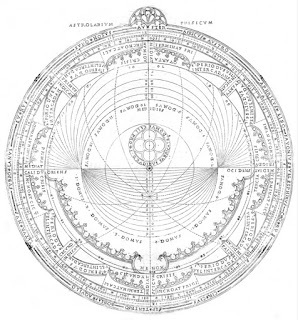 The New York Public Library gives us this image of an astrolabe, which could make for a particularly interesting coloring page because in the original the lines aren’t intended to outline shapes or build up an image, yet they divide the space into lots of interesting areas with lots of possibilities. What would it look like with the emphasis on shapes instead of lines? The whole coloring book is here. And one more bonus coloring book for you, from the University of Minnesota. It features a few nice mythical creatures, available here. 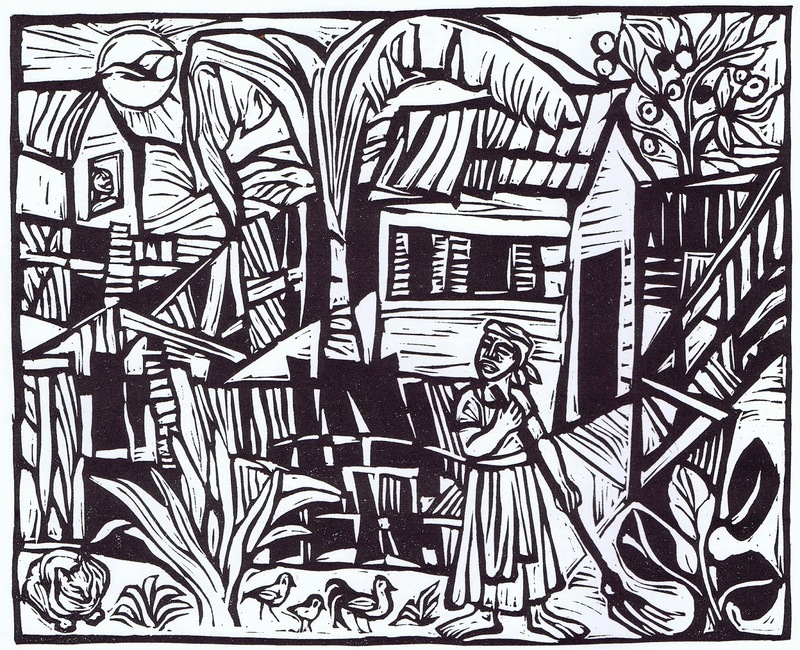 I’ve recently discovered another book illustrated with wood block prints. 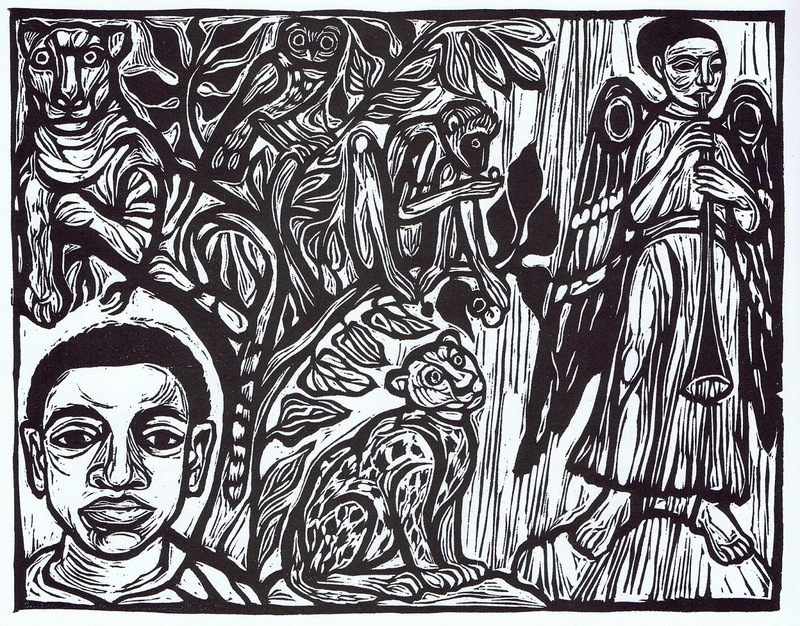 Walk Together Children is a a collection of Black American spirituals, simply the music and lyrics, illustrated with large wood block prints by Ashley Bryan. These blocks are quite rough-hewn, with the space entirely full of details or textures. Interestingly, the pages of music are also carved, but I’m focussing on the pictures, and I’ve selected a few to share with you today. First up, a really beautiful portrait of a family. They hold up their heads with dignity, and their faces are rough-worn but they look as if they might be just about to smile. Their eyes are especially beautiful. 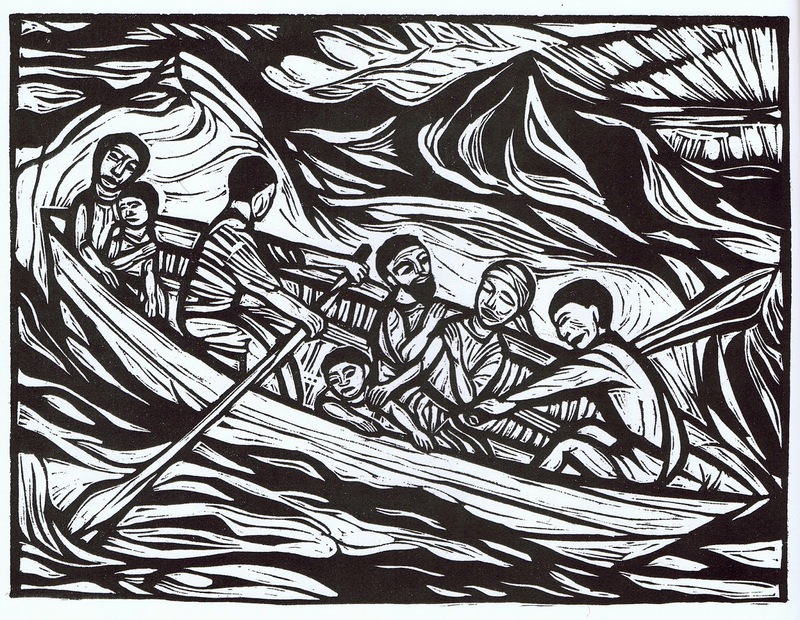 The people in this second piece are much less detailed, and the two at the back of the boat look a bit wooden, although the family in the middle are lovely. 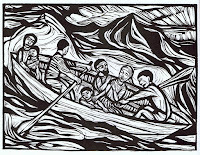 The huge waves and rough water almost dwarf the boat, and the oarsmen are straining. The child looks quite unhappy - I hope he isn’t going to be sick! - but by contrast the man and the woman in the middle are quite calm, singing in their faith. I like all the details in this view of small houses, possibly slave quarters, or possibly a humble freehold. Overall the piece is quite busy with a lot going on, rather jumbled together, but I like the one white leaf on the plant in the lower right, and I like the tree in the upper right. I like the chickens, and the pattern of the crookedy shingles on the roof. Finally, here’s a piece with several separate elements, rather than a single cohesive scene. My favorite part is the tree with the animals, especially the owl and the monkey. I like the way the leaves fill in all the spaces between things, sometimes black and sometimes striped. I’m dubious about the angel’s embouchure, having a couple of trumpeters in the family, but I like the wings. The young man in the lower left is once again beautifully portrayed. I’ve seen some of Ashley Bryan’s other artwork, including sculptures made from found objects, and he always has a nice sensibility of finding the beauty in the ordinary. 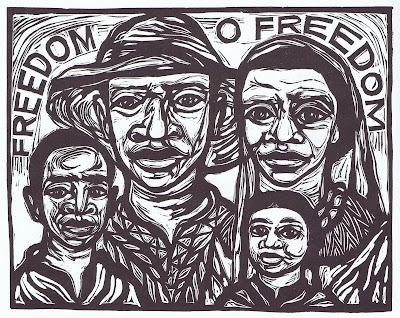 It’s a real treat to see how his block prints reflect the dignity and joy in songs born of injustice and unspeakable hardship. 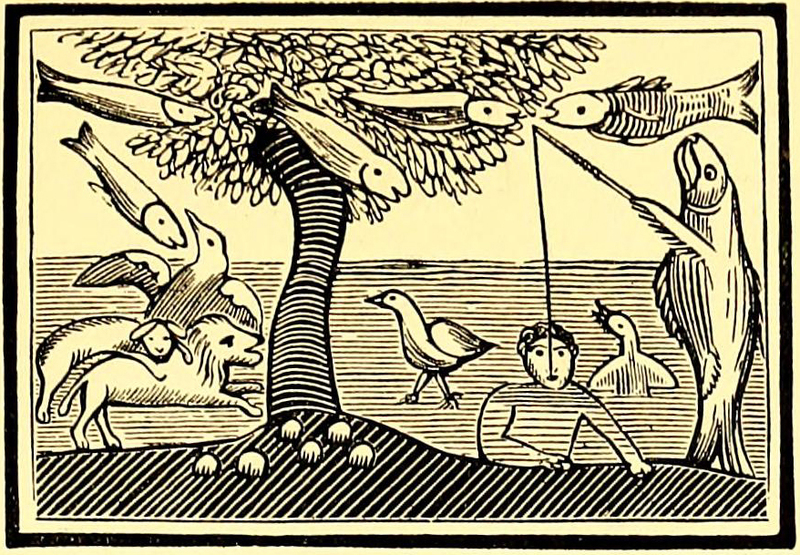 The fish fishing for a man is obviously what inspired the poem, but you can also see that fish are flying in the air and birds swimming underwater, and a lamb is attacking a lion or wolf. I'm not sure what the balls under the tree are - apples growing from the ground, perhaps? 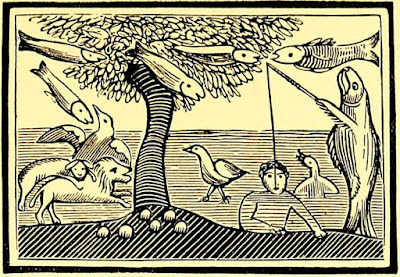 “The World Turned Upside Down” was the name of a British ballad from the mid-seventeenth century, which had nothing to do with fish or birds or any of the rest of it, so the original block print doesn’t illustrate that. It leaves me very curious as to what the original block print illustrated. Anyway, I think it’s funny. 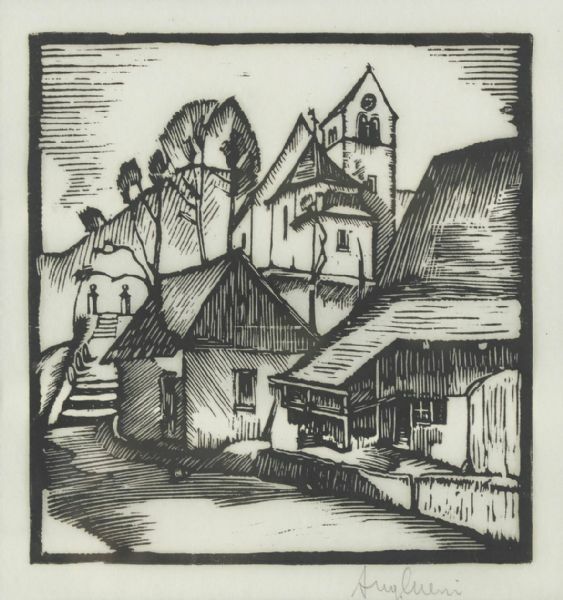 Here’s a pleasing wood block print by August Cueni (Swiss, 1883-1966). I can’t tell you anything about him, except that he seems to have been primarily a painter, and to have painted primarily in a post-Impressionistic style reminiscent of Cezanne. 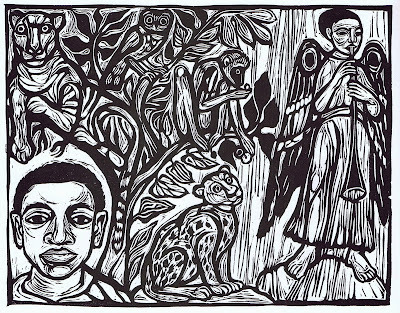 I basically found this one woodcut, which I like a lot. 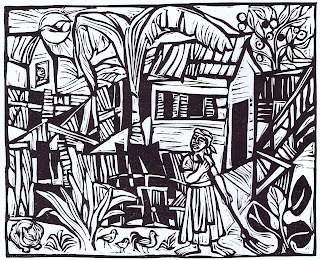 Some subsequent searching around turned up evidence of a book of his wood block prints, but not much in the way of decent pictures. So that makes Cueni a good artist to enjoy today, the day before another sale (Needham Winter Arts Festival). 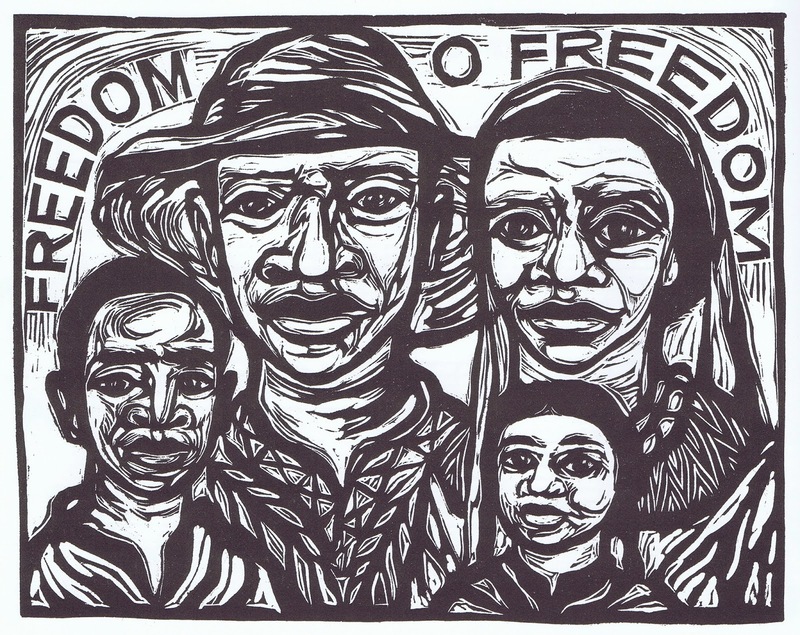 So there aren’t details or analysis, just a wood block print I like, that I’m sharing with you. My schedule this week seems to be one unending parade of meetings, which is not my idea of happiness. 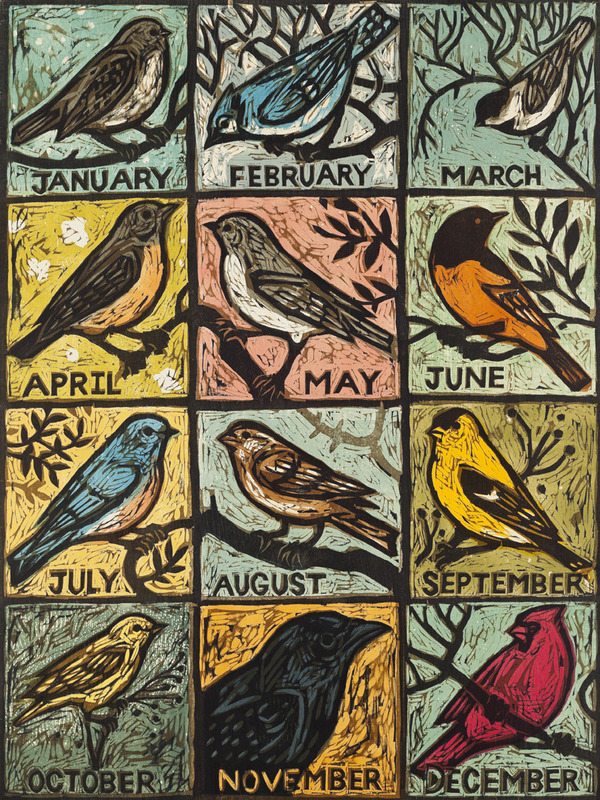 Moreover, what time isn’t spent in meetings is spent in preparing for the Needham Winter Arts Festival this Saturday, so here’s something cool just to tide you over until I have more time for blogging. 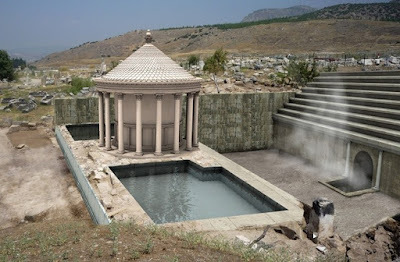 No, it isn’t new news, dating back to 2013, but in case you missed it at the time, archaeologists discovered a classical site in southwest Turkey believed to be a gate to the underworld. About two thousand years ago the Greek writer Strabo described the entrance to hell, “The space is full of a vapor so misty and dense one can scarcely see the ground. Any animal that passes inside meets instant death. I threw in sparrows and they immediately breathed their last and fell.” A temple over a lethal cave in which the power of the god of the underworld strikes invisible instant death? Sounds like a fantasy site, all right. Apparently people made pilgrimages to the site to offer sacrifices, to witness that animals died but the priests could enter the gate of hell and return unharmed, and to ask questions of the oracles. And now, lest we’re too eager to dismiss this all as a load of ignorant superstition, it looks like the site has been rediscovered, complete with invisible instant death. The cave is full of carbon dioxide from nearby hot springs, and the archaeological site includes the remains of a temple, steps on which pilgrims could sit to watch the spectacle, inscriptions to Pluto, and dead birds - not ancient birds, but modern, forward-thinking birds of today who are attracted by the warmth of the cave and suffocate in the poisonous atmosphere. As for the oracles, they were presumably hallucinating in not-quite-deadly fumes, and we don’t know for sure how the priests managed to enter the cave and miraculously survive. I think they must have figured out that the poisonous gas is heavier than air, so they could have used pockets of oxygen to get a safe breath inside. Anyway, my point here mostly is just that this is cool. 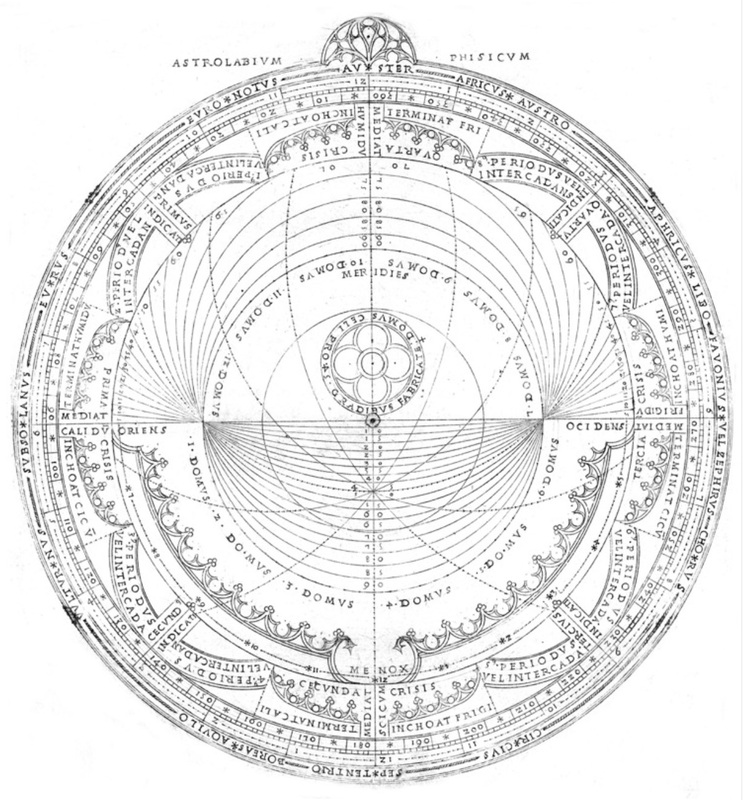 But also the reminder that much fantasy is rooted in real phenomena. It isn’t just a way to explain the physical mysteries of the world, but a way to use the physical mysteries to think about the intangible mysteries. I may not believe in an actual theological hell that can be entered from a ruined temple in Turkey, but I do believe that this whole story tells us some thought-provoking things about how humans encounter the concept of death, how they treat animals, how they use (and take advantage of?) each others’ wonder, how they experiment with (and abuse?) their own minds, and more. Here’s a somewhat longer article. 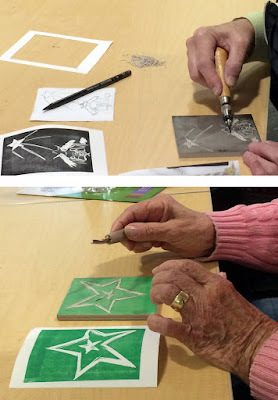 Many adults’ experience of block printing consists of making a family holiday card back in the days before ubiquitous photo cards. That may seem hopelessly old-fashioned, but remember that retro is cool! On Tuesday I ran a printmaking workshop at a local senior living community, at which people could make cards (or, of course, any small relief block print). Some people came with ideas, sketches, or pictures to work from, while others came ready to start from the very beginning, but soon they were all working on drawing designs. A couple were members of the local Art Association, while one or two did not think of themselves as being artsy at all. Combine this diversity with the fact that people always work at widely variant speeds and we had a wide range of progress, from a woman who unfortunately had to leave very promptly and never even got to print, to one who stayed half an hour late and was able to complete about a dozen cards. Still, I think everyone got excellent work done. 1. If you want to make a single whole scene you’ll need a piece of rubber in the neighborhood of 3.5x4.5 inches. That will fit nicely on standard 8.5x11 inch paper that’s cut in half and folded once, which fits nicely in standard “invitation” envelopes. 2. Another option is to cut smaller, simpler blocks that can be combined into larger patterns, such as holly leaves and berries, or snowflakes, or stars. 4. You don’t have to stick with white paper, of course. You could print on colored paper - white snowflakes on blue, green pine trees on lighter green, black birds on bright red… You get the idea. 5. 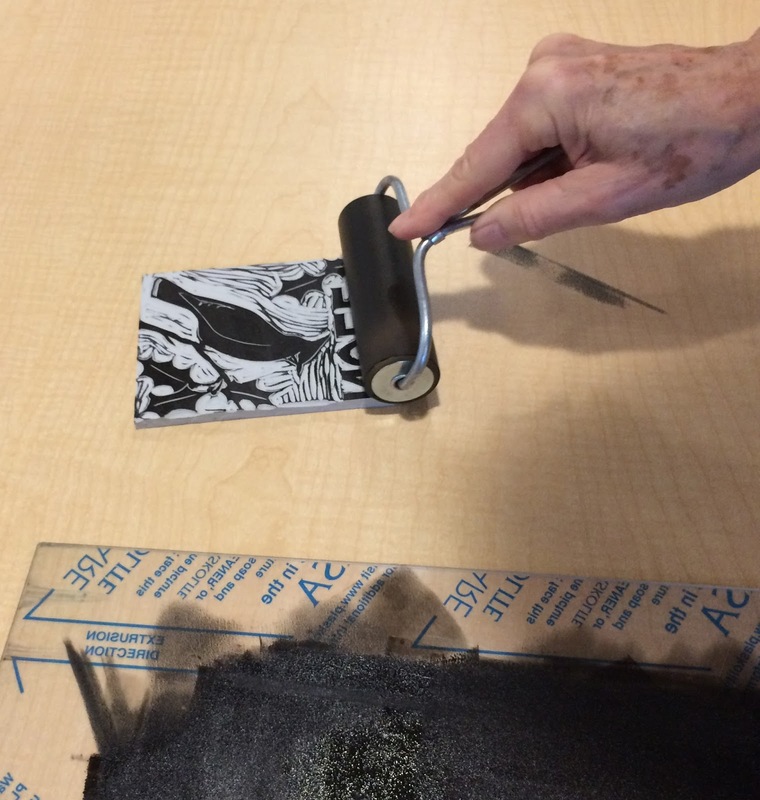 Remember that you can use a stamp pad if you don’t have ink and brayer. It isn’t hard to find pads in all different colors big enough for blocks of this size. 6. It may help you to pre-fold a few cards before printing in order to help you get used to where you have to print your block. Without thinking it through, you may find you’re printing your cards so they open upside-down or backwards. At the very least, don’t print an entire batch before you’ve checked that they’re right! 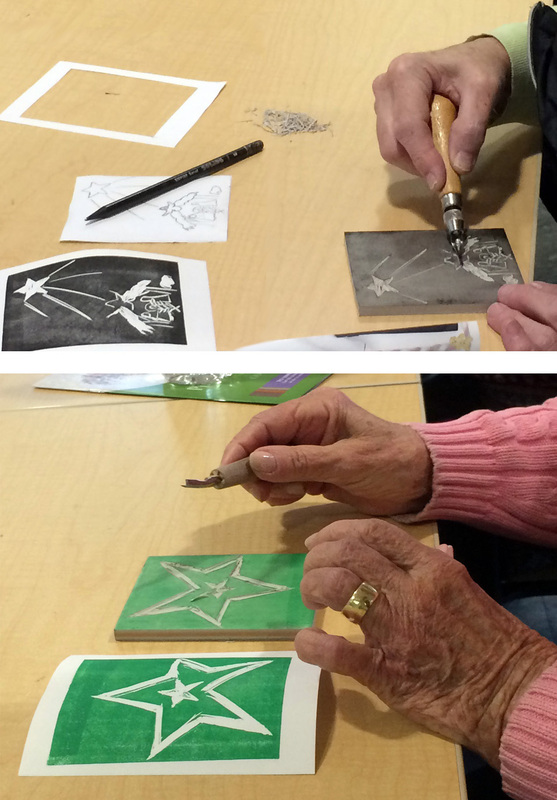 I think the participants in my workshop made some really attractive designs, and I worked on my holiday design, too. We’re just doing what we can to put the ART in HeARTfelt Holiday Wishes!